I have come to the realization that I don't DO purple. Purple is probably one of my least favorite colors to work with. I therefore do not have a lot of purple fabric in my stash. To challenge myself this week I have decided to make a simple baby quilt with purple and green fabrics. 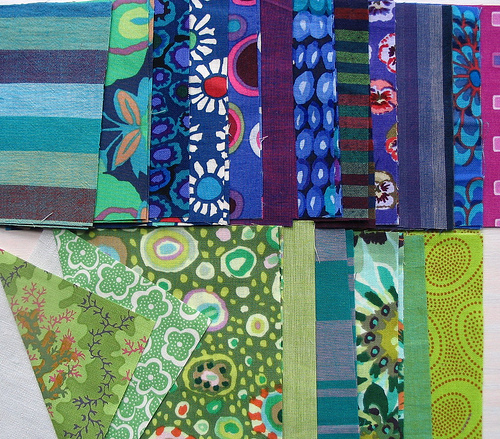 I do, however, have A LOT of Kaffe Fassett fabrics that I love, but I don't seem to use them very often. So they were also targeted for use in this quilt. I have combined the colored fabrics with a solid Handkerchief Linen fabric (55% cotton/ 45% linen), and have made some half square triangles. The linen colorway is birch, a light beige almost grey color. I am going to spend today sewing the blocks together. The blocks are fairly small. 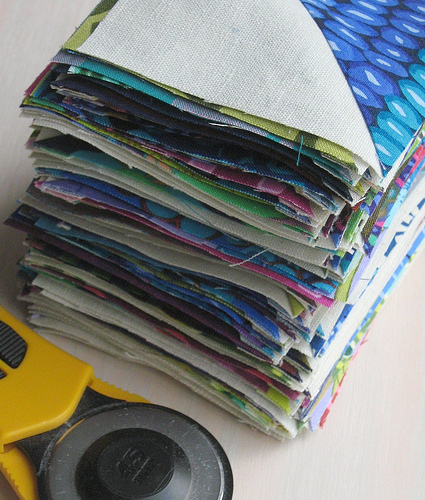 Including seam allowances they measure just 3.25 inches square. Progress is slow today, but I am pleased with the color combination. Wow. I am TOTALLY a green-blue-purple girl, so I am loving that quilt! Looks great! I'll take the purple! It's my favorite color. I don't think I have any purple in my stash but after seeing your baby quilt...well, I may just have to change that! The purple and green looks fantastic together. The color combinations are fabulous! In fact, I own some of those fabrics and love them. However, you definitely need more purple. I just love purple. The HST's are just joyful! Just gorgeous (again!) and I know where you have been! I phoned just after you had left the shop and mentioned a blogger friend had recommended them to me and they knew who it was immediately - that really tickled my fancy! They are sending samples - nice people - - so the colour is birch - just wonderful! They're not really my colours either but they look great! Amazing what some simple linen will do to make even the least obvious fabric choice stunning. I'm there with you on the purple. For years I refused to have anything purple at all in my closet, but now I am trying to have a bit more of an open mind. Good for you for breaking out of your comfort zone! I'm with you. Purple generally scares me. So I am somewhat bemused that you have completely one me over with your pics! Ditto on the purple. I use it but it has to be with other colours, I find it hard to look at an all purple quilt for too long. I love anything Kaffe though and the green with it is a great choice. It looks lovely! I really can't stand the color purple - and I'm working on the second quilt with it, lol. Good for you for taking something you don't really like and making something beautiful with it! Love the vibrancy of your fabrics!! It's a great color combination. I like it when you do, do purple. I just started a similar one with blue Kaffe Fasset. I love his fabric, but I find it hard to use with other fabric. I think we all have colours we gravitate to...I love blue, but find green a difficult colour to buy and sew with. What is it about purple? It's my least favorite color and I have NONE in my stash. The only purple I've worked on is baby soft lavendar. Your color combos are so pretty. Love Kaffe. The greens look great with the purple. Purple is my least favorite color, too. 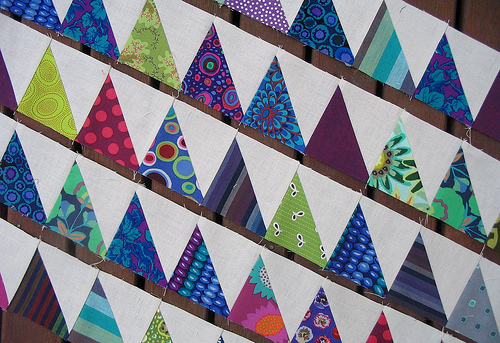 I'm eager to see how those triangles end up coming together with the magic of quilting! I am loving how it is turning out. Can't wait to see the end result! It looks great. Again, you are so amazing with putting fabrics together! Purple is the color I use most, and I can safely say you've done it magnificent justice here! Love the fabrix. I need some Kaffe. I want your fabric. All of it.